Albergue Pedra da Sereia is located in the the bohemian neighborhood of Rio Vermelho where well known artists like Jorge Amado, Dorival Caymi, Carybe and others resided in the past. APS is close to small food markets, clothing shops, banks, money exchange, the post office and only a 10 minute walk from Rio Vermelho Square a lively meeting place where you can try local culinary delights like acaraje, beiju de tapioca and caldo de sururu while sipping a cold beer or a glass of wine. Rio Vermelho is famous for its nightlife where you can find many excellent restaurants, music bars and nightclubs. But be careful to not stay out all night so you can get up early to enjoy the beautiful beaches the neighborhood offers. On Feb. 2nd Rio Vermelho is also home to the festival of Iemanja - the century-old Bahian tradition of paying tribute to Iemanj, the Yoruban goddess of the sea - a colorful offering of gifts via sea procession. Pedra da Sereia Hostel is right on the outskirts of the neighborhood Ondina which is famous for its carnival circuit Barra/Ondina, in ten minutes you are right in the middle of the world's biggest street party but have the advantage of being far enough away to sleep in silence. Michael, the owner, was born in the USA but his mother was Brazilian. This fact brought him to the Northeast of Brazil in search of his roots where he ended up living for the past 24 years. Needless to say he is more than willing to help his guests get situated and enjoy the many different aspects of Salvador. Being an English teacher in Bahia he has many contacts for classes in: Portuguese for foreigners, capoeira of Angola, surfIng and diving all this within 200 meters of the hostel. 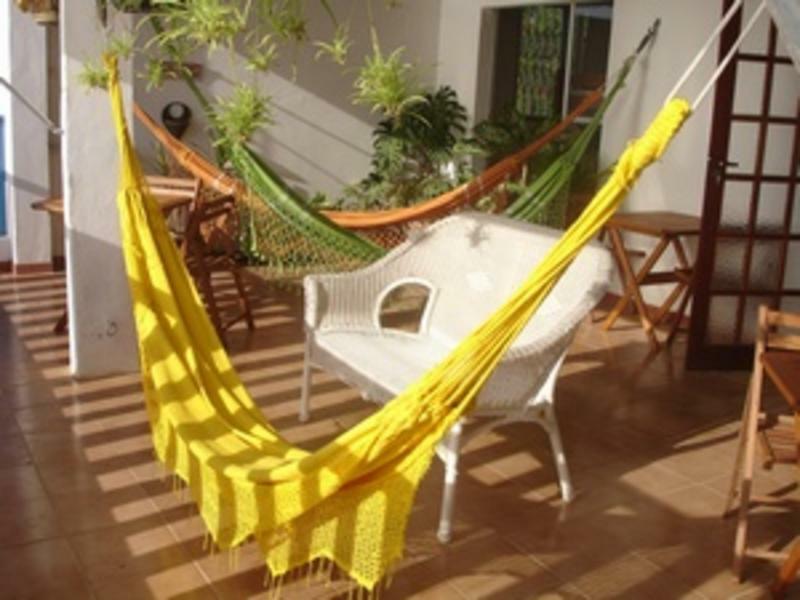 Come and enjoy the beautiful, exotic city of Salvador da Bahia and the comfort of Pedra da Sereia Hostel. Albergue Pedra da Sereia is located in Rio Vermelho, near the Praa da Dinha da Acaraj, almost Ondina. We're situated on the same street as the Japanese restaurant, Sukyiaki and a well known bar/restauarnt Pedra da Sereia!